Mangroves are a great way to add character to your aquarium setup or even your home. They can be watered with fresh or salt water. Oftentimes aqaurists use mangroves within their sump to remove nitrates. 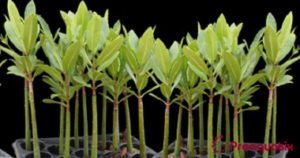 In fact, our mangrove propagules thrive as they are kept within one of our outdoor sumps awaiting shipment. Shipping our mangrove propagules is a breeze. After our mangrove propagules are removed from our growing area, the roots are individually wrapped in a moist sheath. Then the propagules are packaged and sealed in standard shipping bags. They hold up great and can endure long shipping periods. Mangroves require sufficient lighting. In addition, every week or so, salt should be wiped off the mangrove leaves. For best results, supply the mangrove with a rock, gravel, sand, or some other substrate for the root system. However, temporary care can be quite simple, we keep our mangroves in nursery racks (pictured above) with the roots about halfway submerged within one of our sumps.